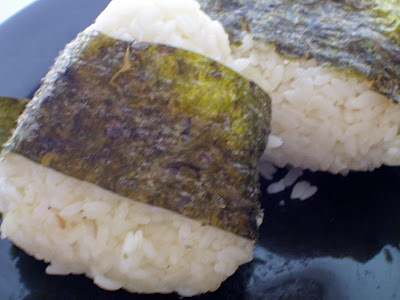 In a post earlier this week, I made reference to onigiri (rice balls) wrapped in roasted nori (seaweed). Here's a photo of onigiri I made this afternoon. I cooked some Japanese sushi rice this morning. When the rice cooled down, I wet my fingers, sprinkled a bit of salt in my palms, grabbed a some handful of rice, and began pressing and molding the rice into a somewhat triangular shape. I wrapped a strip of nori around the rice ball and ate. My mother would add a pickled plum in the center of the rice ball. Oh how lovely! We have a cute little Japanese market in Cambridge that sells onigiri with various fillings (I usually go for the spicy tuna.) But I've never seen roasted nori before. I had a coworker who's wife made him onigiri for his lunch and sprinkled sesame seed seasoning on them. Big yum! Very nice site--please thank Patch for the head's up and keep it coming. As an omnivore surrounded by vegetarians whom I adore, I can always use the inspiration! Shopgirllove - actually, I meant to say nori (roasted seaweed). I've seen it come in black sheets and in dark green sheets. I tend to buy the green nori because I think it has just a little more flavor.